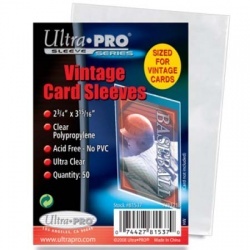 Our many sizes of soft sleeves protect trading cards (baseball, basketball, Pokemon, Beanie Baby, etc. ), postcards, photos, artwork and more. All sleeves are available in case quantities, and some are available in individual packs. Contact us with any questions. CASE QUANTITY. 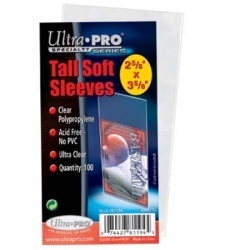 Consistently-sized sleeves hold standard size trading cards. CASE QUANTITY. 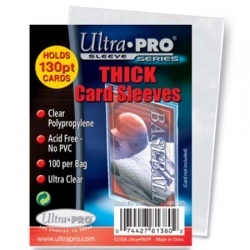 Soft sleeves hold standard size trading cards. Made to hold cards measuring 2-3/4" x 3-15/16". CASE QUANTITY. Made to hold cards measuring 2-3/4" x 3-15/16". Holds standard trading cards up to 130 pt. CASE QUANTITY. Holds standard trading cards up to 100 pt. Holds tall trading cards, such as Basketball cards. Also holds CdVs (Carte de Vistes). CASE QUANTITY. Holds tall trading cards and CdVs (Carte de Vistes). Archival-grade, acid-free and non-PVC premium card sleeves designed to hold standard 2-1/2" X 3-1/2" cards. CASE QUANTITY. 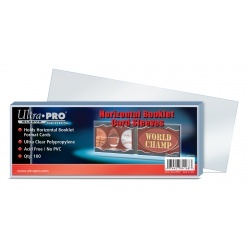 Archival-grade, acid-free and non-PVC premium card sleeves designed to hold standard 2-1/2" X 3-1/2" cards. 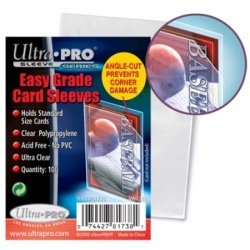 Resealable sleeves that hold PSA slabs, Beckett slabs, 1/4" screwdowns, etc. CASE QUANTITY. 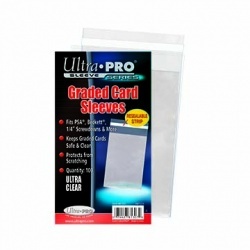 Resealable sleeves that graded slabs and screwdowns. Holds 4" x 6" photos, postcards, and other items. Holds 5" x 7" photos, postcards, and other items. CASE QUANTITY. Holds 5" x 7" photos, postcards, and other items. Holds 8" x 10" photos and other similarly-sized items. CASE QUANTITY. Holds 8" x 10" photos and other similarly-sized items. 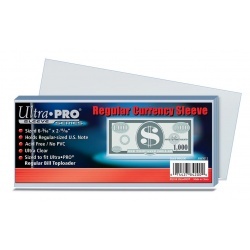 Soft sleeves that hold currency sized 6-3/16" x 2-11/16". CASE QUANTITY. 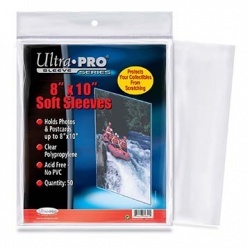 Soft sleeves that hold currency sized 6-3/16" x 2-11/16". 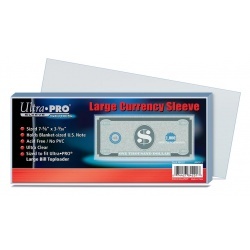 Soft sleeves that hold currency sized 7-5/8" x 3-3/8"
CASE QUANTITY. Soft sleeves that hold currency sized 7-5/8" x 3-3/8". Archival-grade, acid-free and non-PVC soft card sleeves designed to hold horizontal booklet format cards. CASE QUANTITY. Holds horizontal booklet format cards. Archival-grade, acid-free and non-PVC soft card sleeves designed to hold vertical booklet format cards. CASE QUANTITY. Holds vertical booklet format cards. Sleeves measure approximately 2-5/8" x 3-5/8"
This is the CASE QUANTITY of this item. Sleeves measure 2-5/8" x 3-5/8"
This listing is for a case of 10,000 sleeves (100 packs of 100 sleeves). 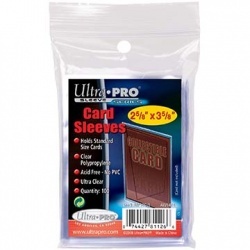 Made to hold cards measuring 2-3/4" x 3-15/16"
Approximate Outside Dimensions: 3-1/16" x 4-1/8"
Approximate Inside (Usable) Dimensions: 2-3/4" x 4"
This listing is for a case (100 packs of 50 sleeves). 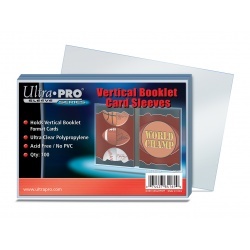 Sleeves measure approximately 2-13/16" x 3-5/8"
Hold standard trading cards up to 130 pt. This is the case quantity (100 packs of 100 sleeves = 10,000 sleeves). If you are looking for fewer sleeves, see this item instead. Hold standard trading cards up to 100 pt. 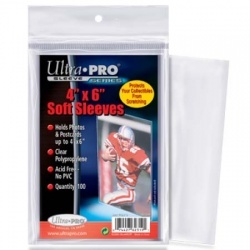 Approximate dimesions: 2-9/16" x 4-15/16"
This is the case quantity (200 packs of 100 sleeves = 20,000 sleeves). If you are looking for fewer sleeves, see this item instead. Archival-grade, acid-free and non-PVC premium card sleeves designed to hold standard 2-1/2" X 3-1/2" cards. Corner is angle-cut on top material to assist insertion of cards and prevent card corner damage. Ideal for use with photos, large cards and with matching size toploaders. 100 count per pack. This is the case quantity of this item (100 packs containing 100 sleeves each). If you are looking to order buy the pack, see this item instead. 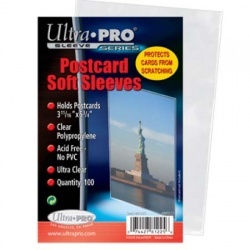 Sleeves measure approximately 3-11/16" x 5-3/4"
Fits 4" x 6" photos, some postcards, etc. Measures approx. 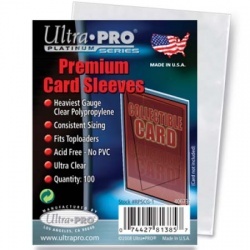 4-1/16" x 6-1/16"
This is the case quantity (100 packs of 100 sleeves = 10,000 sleeves). Fits 5" x 7" photos, some larger postcards, etc. Measures approx. 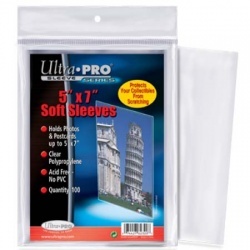 5-1/16" x 7-1/16"
This is the case quantity (10 packs of 50 sleeves = 500 sleeves). If you are looking for fewer sleeves, see this item instead. Designed to hold currency sized 6-3/16" x 2-11/16"
This is the case quantity of this item. If you are looking for individual packs of sleeves, go to this item instead. Designed to hold currency sized 7-5/8" x 3-3/8"
This is the case quantity of this item. If you are looking for individual packs instead, go to this link. 7 1/2" x 2 13/16" (190.5mm x 71.4mm). Archival-grade, acid-free and non-PVC soft card sleeves designed to hold horizontal booklet format cards. Made from clear polypropylene. 100 count per pack. This is the case quantity of this item (100 packs with 100 sleeve each). If you are looking to order by the pack, see this item instead. 3 13/16" x 5 33/64" (96.8mm x 140.1mm). Archival-grade, acid-free and non-PVC soft card sleeves designed to hold vertical booklet format cards. Made from clear polypropylene. 100 count per pack.